The following post is from Jack Harty, a commercial lender with Harty Mortgage Advisors. Various observers of the economy see threats to the economy coming from opposite directions for two different and contradictory reasons. Some think the economy is weakening; others think it is too vigorous and on the verge of excessive inflation. That puts the economy somewhere between Scylla and Charybdis aka a Rock and a Hard Place. We have been warned about mutually exclusive risks of impending recession and an overheating economy (read: inflation). The ancient Greek economist Homer gave us a graphic depiction of the twin threats to the economy in his epic economic treatise the Odyssey. 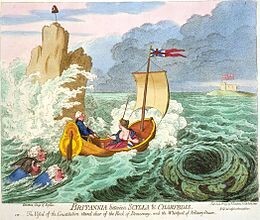 Photo: Scylla (Inflation) on left; Charybdis (Recession) on right. Those who see higher interest rates in the future can still cling to that vision because some day that prediction will be correct…just not in Q1 2019. For those who still cling to the quaint notion that facts-matter, below are some happy facts. The Fed ceased tapping the economy’s brakes in January. Since November, long-term rates have fallen over 50 basis points (1/2%). On January 30 CNBC quoted Fed Chairman Powell: “The case for raising rates has weakened somewhat,” Powell said during a news conference following this week’s two-day Federal Open Market Committee meeting. The Fed vowed to take a “patient” approach toward further hikes. Powell added that the funds rate [short-term interest rate] is “in the committee’s” range of a neutral rate estimate, a key measure for the Fed. Idaho unemployment number ranks 4th lowest in the nation at 2.6% (as of 1/18/19). This compares to Dept of Labor (BLS) numbers for the month of January which showed national unemployment rate at 4.0% (based on U-3 measure). 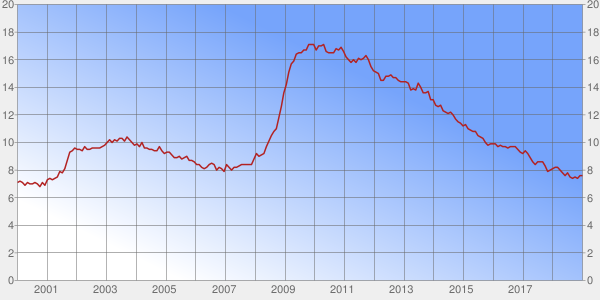 An equally meaningful measure of unemployment rate is the U6 measure, which for December was at 7.6%. U6 is at a virtual decade low. The U6 unemployment rate counts not only people without work seeking full-time employment (the more familiar U-3 rate), but also counts "marginally attached workers and those working part-time for economic reasons." The "marginally attached workers" include those who have gotten discouraged and stopped looking, but still want to work. In January Labor Force Participation was 63.2%. It has been in that range for the past 5 years. Combined with U6 Unemployment, there appears to still be available labor on the sidelines to satisfy labor needs for economic expansion without ginning-up high inflation. 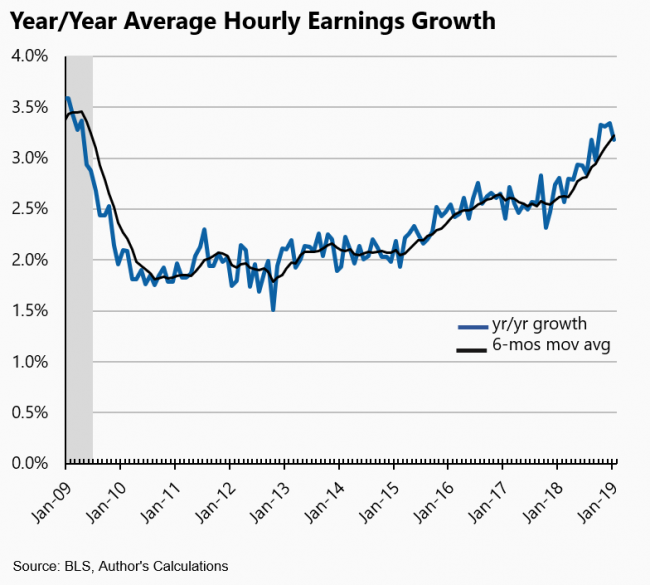 Given the ample supply of labor still on the sidelines, it may explain why January average hourly earnings growth was a tepid 0.1%. In contrast, for the prior 12 months wage growth was 3.3% which is in excess of 2018 inflation of 1.9% (see graph below). Higher wages in an approximately 70% consumer-driven economy is a good thing. Industrial Capacity Utilization is also a meaningful measure of national economic health. That number stood at a virtual 10 year high of 78.4% in December. By comparison, from 1960 - 2000 that rate typically was in the 80% - 85% range. Currently inflation is <2% - productivity growth (1%) is somewhat mitigating wage growth (3.3%) which has yet to fuel big inflation.